Potatoes are slightly unusual because, rather than planting seeds to grow potatoes, you sow "seed potatoes" to grow potatoes. Seed potatoes look like full grown potatoes but they are smaller. 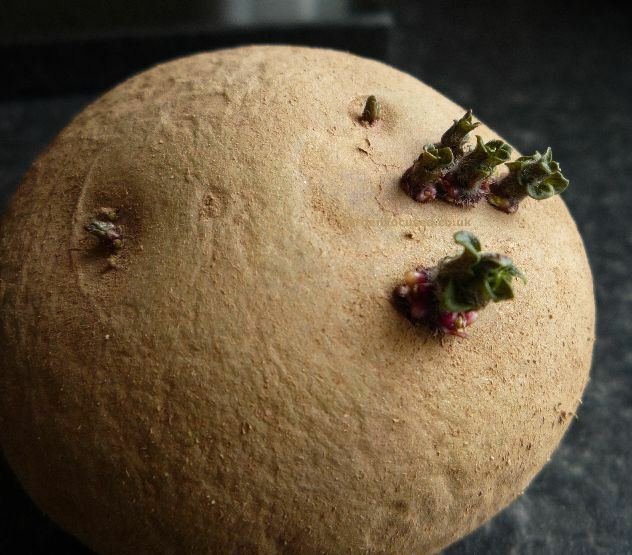 When you plant your seed potatoes under the soil they begin to sprout from little "eyes" on the surface of the seed potato. See the picture lower down on this page so that you can identify what the "eyes" on a potato look like. These sprouts grow to the surface of the soil and appear as the emerging potato plants. Start sprouting seed potatoes (old and new varieties) during the third week of February. Note that the terms "sprout" and "chit" mean exactly the same as far as potatoes are concerned. It is the process of encouraging seed potatoes into life earlier than would normally be possible. To adjust the dates in this article so that they are correct for your area of the UK, click here. There are significant climate differences throughout the UK and setting your town will get the dates correct for you in your area of the UK. If the dates are not set they will default to the UK average. The timing is not absolutely crucial but it makes the whole process easier if you get it correct. The idea is to start the sprouting process off so that the seed potatoes will produce healthy and green shoots 1½cm (three quarters inch) long at just about the time the potatoes can be planted in the open ground. Correct timing will also ensure that the foliage emerges just after the danger of frost has passed. Click the picture below to enlarge it and see more clearly how to identify the eyes on a seed potato. It is from these eyes that the seed potato will sprout main stems. Chitting will give your potato plants a head start and at the same time the seed potato will still be large and healthy enough to allow it to easily produce strong and healthy plants. 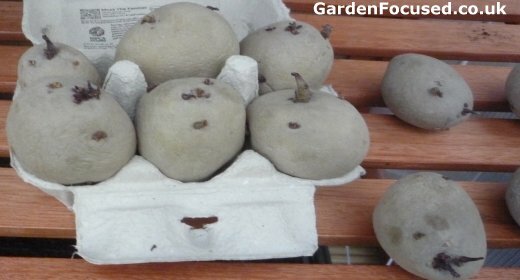 Set the potatoes up in egg boxes or similar so that the majority of the eyes are on the upper half of the seed potato. Try and space the potatoes so that they are not touching each other. Place the loaded egg boxes in a cool (10°C / 50°F) and light position. Just in case you are wondering about that seed potato in the top left of the picture below, it is called Pink Fir. It naturally grows into a different shape compared to most other varieties of potato. It is a delicious variety although it does not produce such large crops compared to many other varieties. Light is especially important to ensure that the stems of the sprouted potatoes are green. A cool window sill is an excellent choice. Depending on the variety and natural state of a seed potato it can sprout anything between 3 and 12 sprouts. When the sprouts reach about 1cm / ½in, rub off all but three or four of them. Simply use a finger to apply sideways pressure at the base of the sprout and it will come off cleanly. Restricting the sprouts to three or four will make the seed potato concentrate all its growing efforts into the remaining sprouts. Sprouted seed potatoes should be ready for planting outside in the fourth week of March 2015 (average for UK). If you sow seed potatoes directly into the ground without chitting / sprouting them, they will grow perfectly well. After a week or two the eyes will develop sprouts and these will grow towards the soil surface and appear above the soil as potato plants. The benefit of chitting / sprouting seed potatoes before you plant them directly in the soil is that the seed potatoes can be started into growth, in warm, controlled conditions, before the weather is warm enough to plant them directly outside. This allows you to harvest potatoes a couple of weeks earlier than would normally be possible. The greatest benefits of sprouting potatoes is most apparent in early varieties. With second early (mid season) varieties, there are definite time benefits but not as great as with earlies. However, with maincrop (late season) potatoes, the benefits are almost unnoticeable because of the long time they take to mature. We would advise sprouting early potato varieties, maybe also doing the same with second early (mid season) varieties. We would not advise sprouting maincrop (late season) potato varieties, the benefits are not sufficient for the work involved. IS IT TOO LATE TO START CHITTING / SPROUTING POTATOES? We are often asked this	question in March / April time and it is normally asked about early potato varieties such as Charlotte. 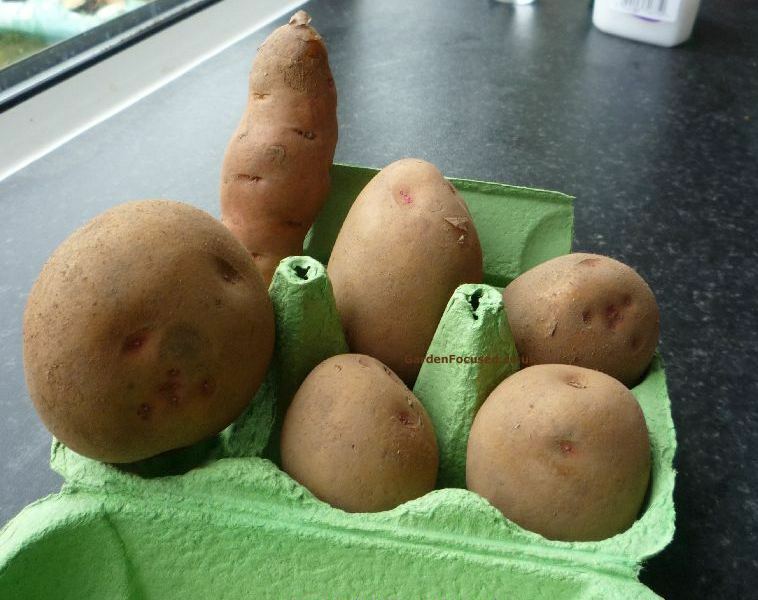 Chitting / sprouting potatoes is by no means essential and will only gain you a week or so whatever variety is planted. So the answer is simple, it's not too late in March or April time to plant potatoes without chitting them. Making sure they don't appear above ground level before the last frost is far more important. A question we are often asked is why not plant potatoes bought from the supermarket rather than special seed potatoes? Your average potato from the supermarket will indeed grow into a potato plant when planted. 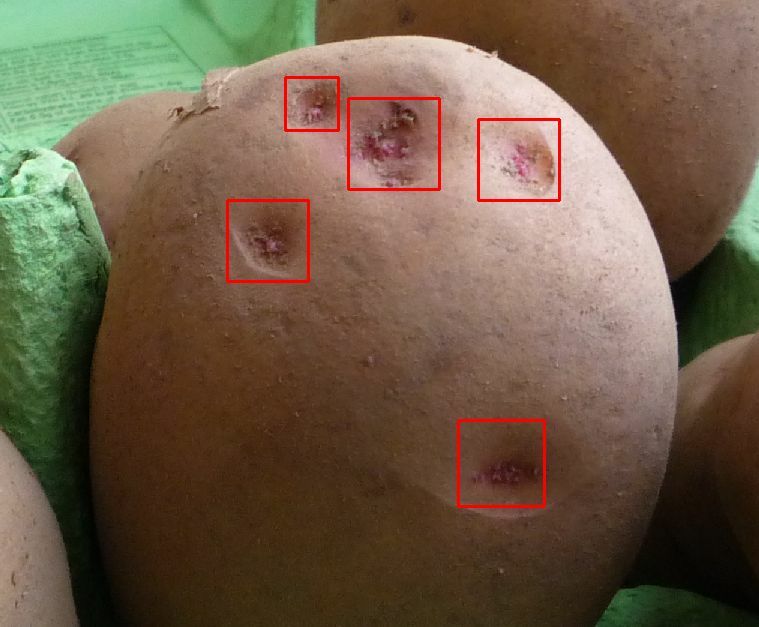 However, potatoes grown for consumption are not as free from disease as seed potatoes. They are in fact much more likely to produce diseased plants compared to certified seed potatoes. So, always buy class A certified seed potatoes for the best results. 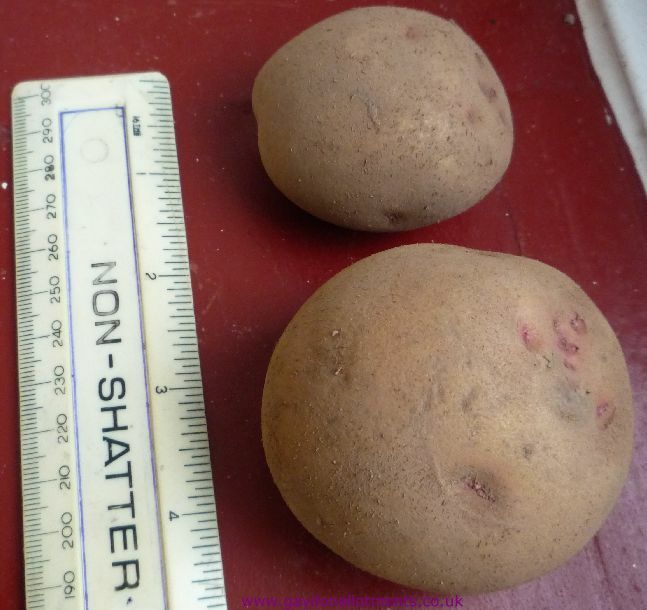 Click on the picture below to see an enlarged photo of healthy well-formed seed potatoes. 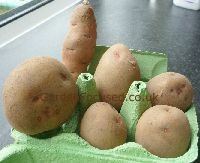 If you get the chance to select individual seed potatoes then choose ones that are about the size of an egg or larger. Smaller ones are OK but ignore those which are half the size of an egg or less. 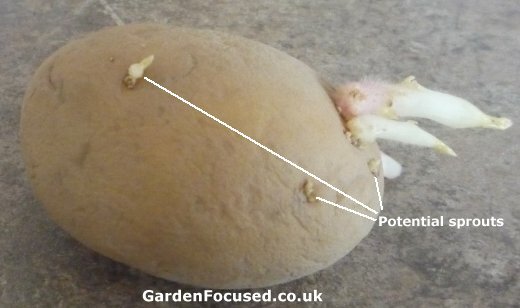 The seed potato should have several eyes (see picture below) because these are where the seed potato will sprout from. 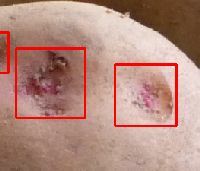 Ignore potatoes which are cut or otherwise marked, cuts can allow the entry of disease. Finally check that the seed potato is plump and hard to the touch rather than shriveled. If you buy your potatoes online, choose companies that have a good history. There are several on the internet; we frequently buy ours from Jamieson Brothers in Scotland. They supply potatoes to many other retailers and have never disappointed us. One particular variety of potato which we recommend for grow bags / containers is Vitabella. We trialed this variety in 2018 and were very impressed. They are classed as first early and they began to produce a crop in late June as we would expect. The potatoes tasted and look excellent with skins that don't need peeling. Vitabella also have another outstanding attribute, lightly boil the for around 18 minutes and they are not only cooked to perfection but they show absolutely no sign of falling apart. They continued on to produce potatoes until the end of October. Those left outside were still delicious at the end of November. We were truly surprised at how they spanned the early to late season with just one sowing. Seed companies and garden centres sell seed potatoes too early in the year. This results in the potatoes sprouting too early, often in the dark where you have stored them. 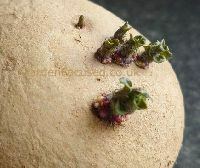 Below is a picture of one of our seed potatoes taken on March 21st. According to the vegetable calendar we should be planting the seed potatoes in the second week of April. By that time the sprouts will be too long and also they are white (they should be green / purple) because they have been stored in the dark. The picture below is a good example of this situation. Note however, the picture shows three under developed potential sprouts. The solution is to remove the three long sprouts by simply applying sideways pressure at the base of the sprout and it will come off cleanly. See the picture below. 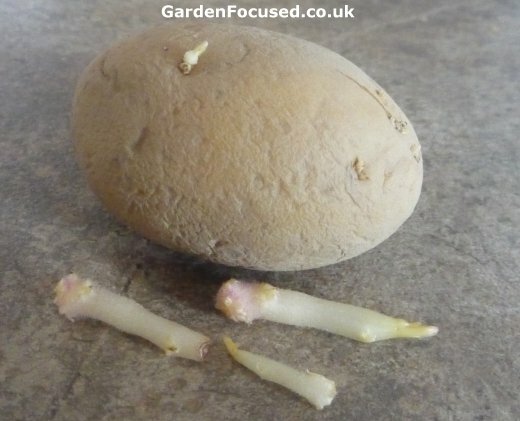 Now start sprouting / chitting your potatoes again as described earlier on in this article. You will find that new sprouts grow, this time hopefully short and healthy. Below is a picture of the seed potatoes which had the majority of their sprouts removed. You can see that when they were exposed to light new healthy, deep purple-green sprouts have grown just over a week later.